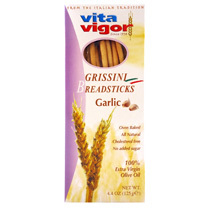 Imported from Italy, these HCG Diet Grissini Breadsticks are the exact breadsticks referenced in Dr. Simeons’ manuscript for the HCG Diet. They’re a tasty, crunchy carb treat while on the very low calorie phase of the HCG Diet. One breadstick is allowed with your HCG lunch and one with your HCG dinner each day of HCG Phase 2. You’ll need one to two boxes to make it through a full round on the HCG Diet. 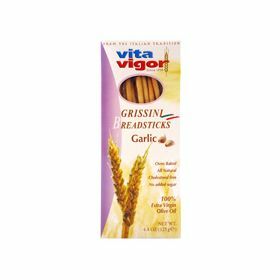 HCG Diet Garlic Grissini Breadsticks Ingredients: unbleached wheat flour (wheat), water, extra virgin olive oil, fresh yeast, sea salt, malted cereals flour, garlic powder, gluten, garlic aroma, natural antioxidant: rosemary extract. This product contains wheat. It is made on the same equipment that also makes products containing sesame seeds and milk.